Hennessy's is close to the eastern boundary of the City, which is a couple of streets further east at Mansell Street. 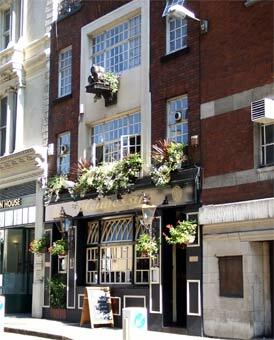 There are three tuns hanging between the first and second floor, a legacy from when this was the Three Tuns pub, prior to 2003. The main bar is on the ground floor, there is a restaurant on the first floor and also a roof top garden which is open during the summer months serving food, an unusual and little known treat in the City if you are looking for one. It is claimed that In 1888, Albert Bachert, described a suspect with a black hat and bag who approached him in The Three Tuns just before midnight and enquired about the local prostitutes, this was, he thought, Jack the Ripper. Although I suspect this was not that actual pub. In the cellar, part of the eight foot thick City wall remains (AD 160), which ran from the White Tower to Aldgate and was the original City wall.